How Exactly Do You "Do A Leicester"? So just how exactly do you "Do a Leicester". The phrase is destined to remain within footballing folklore for years to come but what were the factors? 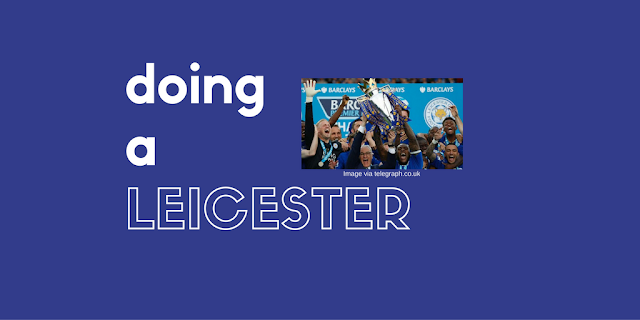 Why did Leicester, the 5000/1 shot storm the league in 2015/2016? Jamie Vardy, having a party? It's the classic Roy of the Rovers fairytale that every young person playing football dreams of. Jamie Vardy was (as I'm sure you are all well aware) released by Sheffield Wednesday as a youth. In 2007 he started playing for Stocksbridge Park Steels and by 2010 he was with FC Halifax. In 2011 he signed for Fleetwood Town, helping the club win the Conference. Finally, after many would have given up, Leicester came calling.